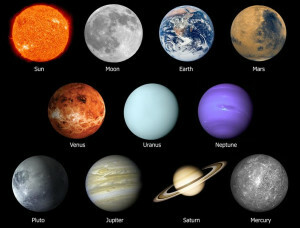 In astrology, the word planets is used to describe astrologically significant points in the sky which includes the Sun and Moon, as well as many objects that are not currently astronomically defined as planets such as Chiron and Pluto. 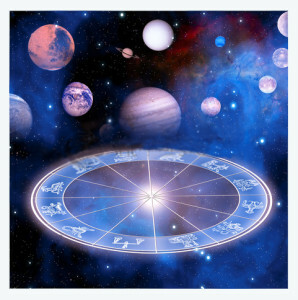 Each planet is associated with a zodiac sign, and that sign will exhibit traits of the planet. For example, turbo-charged Aries is ruled by warrior planet Mars. Cheerful Sagittarius is ruled by optimistic Jupiter. If you want to learn more about your sign, look no further than its ruling planet. The location and movements of the astrological planets, sun and moon are the major influences of the traits associated with the zodiac signs. 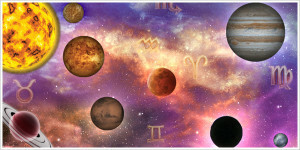 The exact position of the planets, sun and moon at the time, date and location of your birth make up your natal chart. These locations are ever changing in the heavens and continually influence your current horoscope and future events that take place in your life. Each planet rules a specific zodiac sign; however, they all have some type of influence over all of the other signs. A luminary, rules Leo, his element is Fire and represents masculinity. It defines your inner center; personality, ego, the self, who you really are, how you relate to others, leadership qualities, creativity, vitality, life force and spirit. It governs reason, not intuition. The Sun represents the masculine part of your personality. Whether male or female, the Sun holds clues as to how you may relate to your father or other male figures in your life. A luminary, rules Cancer, her element is Water and represents femininity. It governs emotions, feelings and gut instincts. Whether male or female, the Moon holds clues as to how you may relate to your mother or other female figures in your life. Rules Gemini and Virgo, and Earth is its element. Mercury, the messenger of the gods, governs communication which means, how you relate to others and how others hear you. It is concerned with how you process and receive information. It is associated with your central nervous system, which is the key to communication and coordination between your physical and mental processes. and your pleasure centers like love, attraction, prosperity and contentment. It defines people who you are drawn to and those who you want to run away from. Venus also governs loving relationships and not just in the physical sense, but also in the mental sense. She seeks to unite you with the significant people around you. both physically and emotionally passionate in pursuit of a romantic relationship and when in a relationship, as well as toward life goals. Rules Sagittarius and Pisces, and Air is his element. Jupiter is known as the King of the gods and is considered a social planet. It encourages your expansion and realization of a higher consciousness and reaching your dreams. Jupiter opens your path through travel, education, philosophy and the tests that you encounter along the way. It is optimistic, lucky and helps you to feel safe and secure in your environment so that you may take risks and seek the truth to help you toward your financial and personal goals. Rules Capricorn and Aquarius, and Earth is his element. Saturn is a serious planet and helps you lay out your path for success. It puts up limits, restrictions and boundaries so that you stay focused. These are things you may not like, but they are necessary for growth. information about the generation that you were born into rather than your exact nature. It represents a deviation from the norm, eccentricity, individualization, rebellion, self­expression and liberation. It can symbolize an awakening that brings about sudden change, or even chaos and disruption, which can eventually bring about inventiveness and creative invention. slow moving planet, it acts as a channel to connect with intuition, mysticism, the occult and psychic abilities. It guides its generation toward their spiritual consciousness. It symbolizes the dreamer, artist and creative energy. Neptune can be associated with addiction, denial and retreat into fantasy to avoid reality. Pluto rules Scorpio. Pluto is the god of the Underworld or Wealth and is a transpersonal or generational planet, which relates to how a generation will transform itself and how that relates to an individual’s transformation. No element has been assigned to it, although it is believed made up of 98 percent nitrogen ice. Pluto represents transformation, uncovering dark forces within, destruction, compulsion, power, control, life, death, renewal and rebirth. Change will take place whether or not you embrace it. You will need to let go and accept what has been handed to you, either spiritually or materially. The old ways and characteristics will be replaced by something better. It is a relatively ne w comet or asteroid which was discovered in 1977. The name Chiron is taken from Greek mythology and is an immortal centaur —half man, half horse. It symbolizes a wounded healer. Those who have been psychologically or physically wounded will be able to break through the pain of the wound to heal and bring out their fullest potential. Currently, many astrologers do not recognize Chiron as having an impact on the natal chart. However, in time it may take on a greater importance.